The 1986 Red Sox were one strike away from winning the World Series. They came closer to winning - without actually winning - than any team in baseball history. When you watch a tape of Game 6 (shelved in the sci-fi/horror section of New England video stores), it's still impossible to believe. They led the Series, 3 games to 2. They were in New York and took a 5-3 lead into the bottom of the 10th. The first two Mets went out on harmless fly balls. The message board operator at Shea Stadium hit a button and ``CONGRATULATIONS BOSTON RED SOX'' flashed on the scoreboard. Across Red Sox Nation, fans held champagne bottles. Some made the mistake of popping corks. Parents took sleeping babies from cribs and held the infants up in front of the television so they'd be able to tell them later they'd witnessed history. And then all the bad stuff happened. Gary Carter hit a single off Calvin Schiraldi, the closer with fear in his eyes. Kevin Mitchell - who had been on the clubhouse phone making plane reservations to fly home to San Diego - hit a single. Ray Knight hit a single, scoring Carter and moving Mitchell to third. When Carter got to the dugout, he put his shinguards back on, even though the Mets were still behind. Sox manager John McNamara summoned Bob Stanley and the Steamer uncorked a wild pitch (some still insist it was a passed ball), allowing Mitchell to tie the game, and moving Knight to second. Mookie Wilson kept fouling off pitches, then hit a slow roller toward Bill Buckner. The ball skipped through Buckner's legs and into history. Two nights later, the Sox took a 3-0 lead in Game 7, but Bruce Hurst wore down and the Mets won, 8-5. It still stings to recount the events at the end of the 1986 World Series and there's a lesson in this for the 2004 Red Sox. The '86 Sox, the last Boston team to make it to the World Series, are not remembered fondly in these parts because of the way their season ended. Unfair, but true. Even though they staged one of the greatest American League Championship Series comebacks in history, they are labeled as chokers. More than any Sox team with the exception of the 1978 folders, the '86ers contributed to the widespread Nation notion that no Red Sox lead is safe. The 1986 Sox were loaded with talent and experience. They'd been a .500 team in 1985 and little was expected, but that's because 24-year-old Roger Clemens was coming off shoulder surgery. He had yet to establish himself as a big league stopper and his future was in doubt because of the operation. All doubts were erased when Clemens started the season with 14 straight wins. He struck out a major league-record 20 Seattle Mariners April 29. The surprise Sox moved into first place in May and never relinquished the lead (there was no wild card in '86). The Sox clinched the American League East with a week left in the regular season. They had a rotation of Clemens, lefty Hurst, the combustible Oil Can Boyd, and Al Nipper. Clemens finished 24-4 and would win the Cy Young and MVP trophies. Rich Gedman was an All-Star catcher. Buckner was a first baseman with 100 RBIs. Wade Boggs was a hit machine, a batting champ. Jim Rice was still an MVP-caliber slugger. Don Baylor came over from the Yankees and provided leadership and power. Dwight Evans was a 100-run scorer and a defensive force in right field. Marty Barrett was a better-than-average second baseman. General manager Lou Gorman made a midsummer deal involving a shortstop named Spike Owen and an underachieving outfielder named Dave Henderson. The Sox searched for a closer all summer and McNamara finally settled on the hard-throwing Schiraldi, who had won an NCAA championship at Texas with Clemens in 1983. Their ALCS comeback won't be remembered in the same manner as what just happened in New York, but the Sox came perilously close to early elimination in 1986. They trailed, 3 games to 1, in Game 5 in California and came to the plate in the ninth facing a 5-2 deficit. The game and the series was over. Then Baylor and Henderson hit two-run homers and the Red Sox won in extra innings. They wiped out the Angels in the final two games at Fenway, Clemens winning Game 7. The first two games of the World Series were in New York and the Red Sox won both. Hurst dominated the Mets in the opener and Boston scored the only run on a grounder between the legs of second baseman Tim Teufel. Hurst went eight innings. Schooled in Sox history, he was aware that fellow Red Sox lefthander Babe Ruth blanked the Cubs, 1-0, in the first game of the 1918 World Series. The middle three games in Boston were unremarkable. Lenny Dykstra opened Game 3 with a homer off Boyd and the Mets coasted to a 7-1 victory. Nipper, a gutty righty but also something of a meatball artist, got the call in Game 4 and the Mets beat him, 6-2. Hurst was next and he dazzled the Mets again, extending his Series shutout string to 15 innings in a 4-2 win that sent the Sox back to New York with a 3-2 lead. Buckner's error is what folks remember, but a lot of other things contributed to the defeat. The Sox stranded five runners in the first two innings. Rice failed to score from first on a wall double by Evans. In the seventh, Rice was thrown out at the plate trying to score on a single by Gedman. Overall, the Sox stranded 14 runners. The Sox led, 3-2, after seven innings. Clemens had a four-hitter with eight strikeouts and two walks. He had retired four straight batters. He had also thrown 135 pitches. To this day, there is great dispute about Clemens's departure. In the postgame media session, McNamara said, ``My pitcher asked out of the game.'' He said it again to the Globe's Gordon Edes earlier this month. Clemens disputes the version. The game tape shows Clemens in the on-deck circle with a bat in his hand when Mike Greenwell came up to hit for him with one on and one out in the eighth. The Mets tied it, 3-3, scoring off Schiraldi in the eighth. Then Henderson broke the tie with a homer and the Sox took a 5-3 lead into the bottom of the 10th. Then the disaster. The 1986 Red Sox never recovered from Game 6. It was obvious in Game 7. Boyd was scheduled to pitch, but a day of rain allowed McNamara to bring Hurst back on three days' rest. Boyd went out to party and was not seen for awhile. Hurst, who had mentally retired for the winter, was masterful until the sixth inning when Keith Hernandez delivered a two-run single and the Mets tied the game, 3-3. Hurst was tired and New York had a better bullpen. With the Sox trailing, 6-5, in the eighth, McNamara turned to Nipper. Strawberry crushed a two-run homer on an 0-and-2 pitch and Boston was Mudville again. A year later, at the end of a dismal 1987 season, McNamara sat in the dugout and mused about '86. YOUR TURN: Where were you when Buckner made the error? 1918, 1918, 1918. The year is ingrained in the minds of Red Sox followers. In the 86 years since the Red Sox last World Series title, the tortured history  the curse, if you believe it  has been well chronicled. 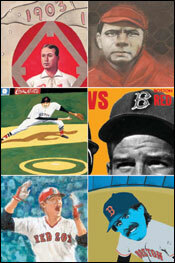 A series of illustrations and stories depicts the teams Series travails.